Sunday March 6th 1898 I was busy about the work all forenoon. The roads are too bad to go to church. I went over to see how Emma was in the afternoon. Did evening work and read till bed-time. weather pleasant. 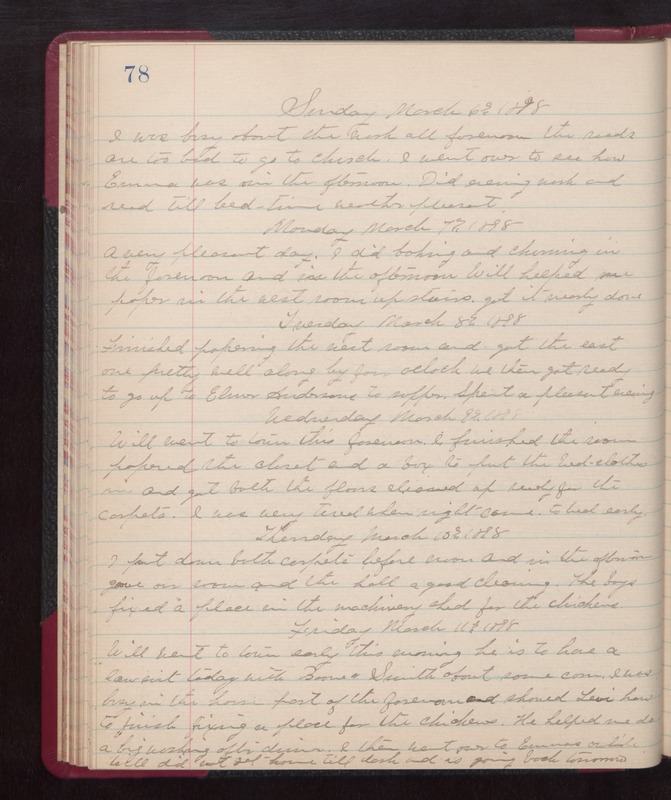 Monday March 7th 1898 A very pleasant day. I did baking and churning in the forenoon and in the afternoon Will helped me paper in the west room up stairs. Got it nearly done. Tuesday March 8th 1898 Finished papering the west room and got the east one pretty well along by four oclock. we then get ready to go up to Elmer Andersons to supper. Spent a pleasant evening. Wednesday March 9th 1898 Will went to town this forenoon. I finished the room papered the closet and a box to put the bed-clothes in and got both the floors cleaned up ready for the carpets. I was very tired when night came. to bed early. Thursday March 10th 1898 I put down both carpets before noon and in the afternoon gave our room and the hall a good cleaning. The boys fixed a place in the machinery shed for the chickens. Friday March 11th 1898 Will went to town early this morning. He is to have a law suit today with Boone & Smith about some corn. I was busy in the house part of the forenoon and showed Levi how to finish fixing a place for the chickens. He helped me do a big washing after dinner. I then went over to Emmas awhile. Will did not get home till dark and is going back tomorrow.